Button Mounts | Wire & Cable Button Mounts | Cal Fasteners, Inc.
Cal Fasteners offers durable, high quality nylon button mounts that will help you quickly position and secure wire bundles, cables, hoses, and the like to panels or other surfaces. A unique, one-piece design allows for fast and easy mounting with no mechanical fasteners required. Wide entry slots make it easy to insert cable ties, and specially-designed tabs prevent cable ties from sliding during installation. Tensioning wings provide extra stability in any application. ROHS compliant. 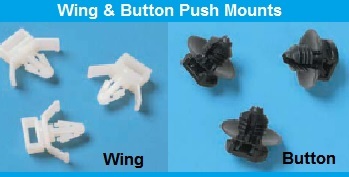 Request a quote on button mounts for your project, or contact Cal Fasteners to learn more.